May 11, 2015 – Engineers from three NASA field centers are partnering this month at NASA’s Marshall Space Flight Center in Huntsville, Alabama, to remove and analyze some 180 small squares of an ablative material called Avcoat — the outer coating of the heat shield that protected the Orion crew module during its 2014 flight test. 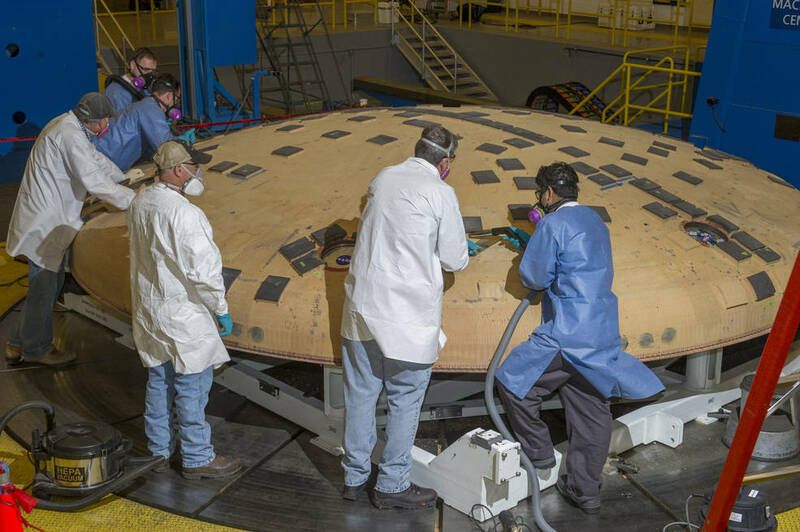 Charred during the successful test flight known as Exploration Flight Test 1, or EFT-1, the 16.5-foot-diameter heat shield arrived at Marshall March 9. It was installed in the center’s state-of-the-art, seven-axis milling machine, which uses precision, computer-aided tools able to fluidly maneuver in a variety of ways to manufacture parts and cut large metal or composite materials or structures. Built for NASA by Lockheed Martin, the machine is the largest of its kind in the world except its twin, now in use at NASA’s Michoud Assembly Facility in New Orleans. The milling machine boasts a fixed, rotating structure that enables researchers to easily inspect the 5,000-pound heat shield and remove samples of the ablated, or slowly incinerated, material from its surface. A heavy piece of Lockheed Martin Ground Support Equipment also is employed, enabling workers to suspend massive structures such as the heat shield at any angle for ease of access. 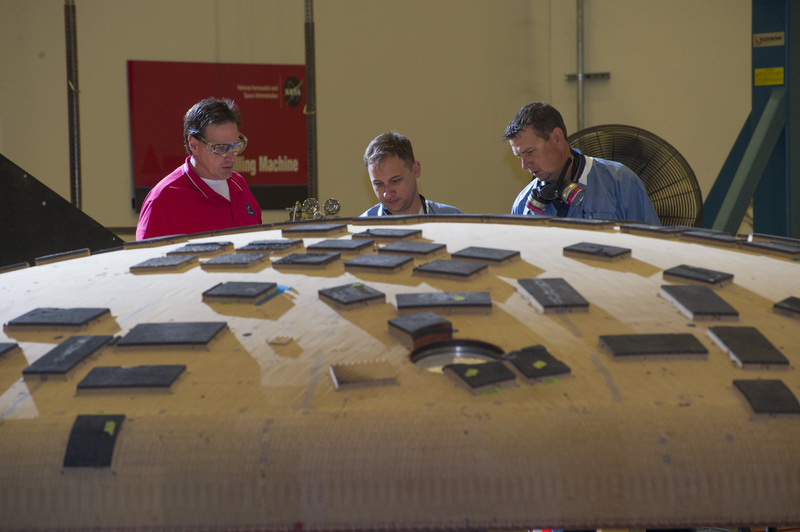 The Orion heat shield analysis work is led by researchers from NASA’s Ames Research Center in Moffett Field, California, while Marshall Center engineers lead the physical machining effort. Personnel from NASA’s Johnson Space Center in Houston, where the Orion Program is managed for the agency, also are on hand to provide inputs during the process. The team will spend the rest of May removing the final scorched squares of ablative material — and the sophisticated data-gathering sensors embedded in many of them — by hand. The sensors, designed and fabricated at Ames, collected critical entry environment and thermal protection performance data during the EFT-1 flight. Once those final pieces are removed for analysis, the milling machine will be used for a final pass. It will smooth the denuded heat shield — actually a series of 320,000 honeycomb-like cells covering the entire shield, each hand-filled with the Avcoat material — leaving a uniform layer one-tenth of 1 inch above the shield’s composite inner surface. The charred blocks, sensors and other materials then will be shipped to research teams at Ames and other NASA facilities. Ames teams who tested and qualified the materials prior to flight, using the nation’s premiere arc jet facilities, will analyze the thermal performance of the material. Data gleaned from the material and from the heat shield’s behavior during reentry will help researchers refine predictive computer models and assist technologists in developing safer, more cost-effective ways to design and build these critical protection systems. The heat shield will be shipped in June to NASA’s Langley Research Center in Hampton, Virginia, for water impact testing intended to prepare the spacecraft for water-landing certification.